India, Energy Future, 1(2), 28. 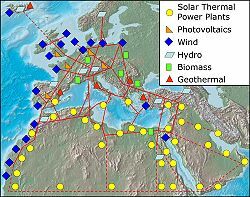 --The "Supergrid" or the "mega-grid" are the new buzzwords on the future energy horizon. Sushumna Kannan reports on the European Supergrid and how it is all set to change the manner in which the world fathoms energy. To purchase this article, go here: http://htsyndication.com/htsportal/subscription. Both literature buffs and those curious about it had a great weekend with the city’s first big literary event. They are hoping it makes a come back. 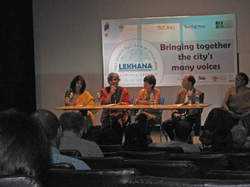 Lekhana, a literary weekend organised by Sangam House, Desha Kala, Reading Hour, National Gallery of Modern Art and TOTO funds for the arts came to an end on Sunday, 12 February. The event included panel discussions, readings and performances. The uniqueness of the event lay in the fact that it was not only about Indian writing in English but brought together creative writers from regional languages as well-they were read directly and were translated in English as well. On day one, 10 February, the panel on ‘City in Literature' saw some free-spirited and open discussions amongst five eminent writers, Anjum Hassan, M K Raghavendra, Zac O'Yeah, K R Usha and Saniya. They each asked why the city is becomes important to writers and whether it necessarily needs capturing with writers offering different opinions. The city, for some, was merely incidental to their work. Anjum Hassan noticed that capturing the city is a relatively new event in literary history. Literature-lovers will have reveled in the discussion of writers who insisted that there was a sense of displacement and loss, of late, which had forced them to acknowledge the city. "What you see is what you get" said K R Usha, on Bangalore and its soul. Usha is the author of Monkey Man, a novel set in Bangalore. Just when everyone was wondering which works captured the city in Indian fiction, U R Ananthamurthy reminded the audience of the works of DVG and others in Kannada. He said that Vidyarthi Bhavan, World Culture, Koshys and India Coffee House probably represented Bangalore, when someone in the audience mentioned that these were the ‘four icons' of the city. The panel was followed by the play, "Five Grains of Sugar," a play by Manav Kaul. The play persisted in its metaphors long enough to make them believable. Day two of the literary fest began with a session on Translations as Conversations. Panelists, Giriraj Karadoo, Lakshmi Holmstrom, Rahul Soni, Arshia Sattar and Vanamala Vishvanatha, disagreeing and arguing their takes on translation and ideology. This was followed by the session, Writing about Writing chaired by Anjum Hassan. The panelists, Vivek Shanbhag, Samhita Arni, Sumana Mukherjee and Rahul Soni discussed forms such as book reviews, histories of literature and the spaces available to write about writing. The next panel by Naresh Narasimhan and S Diwakar saw discussion on the culture elephant -in this there was an emphasis again on Bangalore as a city and the various issues encountered in making Bangalore a better space for people to co-exist in. The speakers evoked a sense of nostalgia in the audience as they spoke of Bangalore over the years and left them with four questions: Is city culture from the city? Is city culture urban? Is city culture for everybody? Does culture need policing? A final session on new writing in Kannada saw the panelists, Vivek Shanbhag, Jayant Kaikini, Raghunath and S R Vidyashankara share with the audience what they saw as new writing and told us why. They located trends within it. Kaikini's crisp and spontaneous speech was fun. He is a Kannada poet and author. Kaikini noted how images get updated from time to time and how criticism competes to keep up with the situation. His anecdotes that illustrated why Bengaluru was a ‘roopaka' rang true. Day three began with the panel, The Joys of Short Fiction, with writers discussing the scope, style and characteristics of this form. Another panel ‘The word and image' discussed relationships between verbal and visual languages and their representations in terms of art history and recent art works. Annapurna Garmella, Director of Art, Resources and Teaching in Bangalore traced the changes in the relationship between word and image from Buddhist times, when images illustrated texts to colonial times when words become words through images. The discussion explored the origin and the various non-linear relationships between word and image. The next panel, What stops us from saying What We want to say, saw discussion on issues such as censorship, the state, law and engaged with artists on how they perceive forms of censorship and where they locate it. The issue, according to Ashish Rajadhyaksha, director of Centre for the Study of Culture and Society, lies between the spectrum of self-censorship and a complete refusal to adhere to any form of censorship. The panel, ‘Body and Biography' discussed the sexual politics of writing about the body in Tamil, Kannada and other languages. The dangers of associating one's writing with one's biography and the risk still in writing about the body were both acknowledged. The fest ended with Girish Karnad reading from his memoir-ended with a bang-we must say. The panels ran alongside readings in Tamil, Kannada, English, Danish, Hindi, Malyalam, Marathi and Bangla. The monotony of the panels, if there was such a thing, was dispelled by the funny skits by Sangam Play House. There was a corner for Book Exchange. That people could take home free a book by ‘saying thank you and promising to read it' was so much fun. Upon giving a book, you could take two books from the pile. Phew! Book lovers, the poetry-crazy, theatre-enthusiasts, filmmakers, artists, professional writers and publishers were all under one roof. But the best part was that people outside the literary spectrum too came to find out what ‘Literature' was all about. Bangalore could do well with more such inter-lingual, multi-form fests. Prof S N Balagangadhara's book 'Smriti, Vismriti: Bhaarateeya Samskruti' looks at the trends in social sciences within India and elsewhere. The Kannada translation of the book was recently released. On Sunday August 29th , the Kannada translation of Prof. S N Balagangadhara's book, "The Heathen in his Blindness"...Asia, West and the Dynamic of Religion (1994) was released at the Kannada Sahitya Parishat in Chamarajpet. The book titled 'Smriti, Vismriti: Bhaarateeya Samskruti', translated by scholar-historian Dr Rajaram Hegde, was released by writer-journalist Ravi Belegere. Published by Akshara Prakashana, the book is priced at Rs 415. An introduction to the book was presented by Prof. Sivarama Krishnan, retired Sociology Professor, Bangalore University. Centre for the Study of Local Cultures (CSLC), Kuvempu University organised the event with support from Nagasri Book House, Jayanagar. The author, Balagangadhara, was a student of National College, Basavanagudi. Currently he heads the research centre, Comparative Science of Cultures, at the Ghent University, Belgium. His work has been received with enormous attention by scholars, students and other professionals alike, and its translation into Kannada is only a fraction of what we will soon see, given the path-breaking nature of this book. Balagangadhara, in this book, questions existing understandings of religion's universal presence, writes a history of the west that reveals its underlying beliefs, exposes assumptions about secularism in contemporary India and carves a path for the study of the Indian traditions - none of which neither Indians nor any others, I vouch, can ignore anymore. Hegde, the translator of the book, also Director, CSLC spoke on the occasion of therelease of Smriti, Vismriti... and shared with all, the impact the book had had on him. He said that there was simply no other book that had relieved him of the numerous impasses he had been struggling with for years from within his discipline in the social sciences. He noted that, for this reason, his experience of translating the book had indeed been fulfilling. He appreciated the lucidity of the book (which, I believe, only a translator can best know) and specified the need to retain words like ‘religion', and ‘secularism' in English. He stressed upon communicating an important work such as this, as against simplistically deeming the usage of English as ‘polluting' Kannada. This, he said, was especially the case with Smriti, Vismriti... because Balagangadhara argues precisely about the problems that, understanding ‘religion' as ‘dharma', ‘pooja' as ‘worship' and so on, have caused, in the study of cultures, be they western or Asian. This speech was followed by the book release by Belegere, who shared anecdotes and experiences on the topics of culture and translation. And next in line was the very useful introduction to the book by Prof. Sivarama Krishnan who began by recounting his dissatisfaction with trends in the social sciences that had led him to interact with the late Dharampal (the historian). He emphasized that after Dharampal, who himself had caught a nerve of life in India, it was Balagangadhara's work that was of great importance. It had shed enormous light on the study of cultures and is very persuasive for the accurate tools it develops, he said. Krishnan covered most parts of the book and succinctly related its arguments that deal with protestant Christianity and its ‘secularisation'-which envelop most discourses across the world today, including the social sciences. He recapitulated the book's argument about European enlightenment being entrenched in Christian thought practices and the wrong assumption of egalitarianism that post-colonial scholars make, with regard to colonial objections to practices like sati, child-marriage, idol-worship and so on. The book points out that objections to Indian practices were raised in imitation of the historical encounter between Rome and Christianity, wherein Christianity had domesticated the several traditions of Rome, and says that the unsuccessful attempts at conversion into Christianity, which Indians and particularly Brahmins eluded, during the colonial period triggered the colonial knowledge enterprise. Moreover, ideas of egalitarianism emerged in Europe only in the 17th century, whereas Indian practices were seen as barbaric even in the 13th century European travelers' accounts of India. The importance given to "practical knowledge" and the absence of religion in cultures like India's came across quite clearly as one of the several important insights presented in the book. Prof J S Sadananda, Director, Academy of Social Sciences and Humanities, concluded the event with a few remarks. He said that it was impossible today to interact in academic circles without first positioning oneself as either ‘left' or ‘right' ideologically and politically, and that what mattered was ‘who one belonged with' or ‘what ideology one subscribed to' more than any intellectual discussion. He said that it was not surprising that they had received similar lopsided feedback about the book so far, and mostly by those who hadn't read it. He stressed the importance of ‘falsifying' theories and urged one and all to read the book and get back with feedback, enabling a better discussion. CSLC has planned book-reading sessions at various places across Karnataka over the course of the next few months. For more details on this, check this blog. To follow discussions on the book, follow the yahoogroup. Meta-Culture, a Bangalore-based Relationship and Conflict Management consulting company, organised an event called Bengaluru Speaks on 21st February 2009 at the Ashirvad Community Centre on St. Mark’s Road.Bengaluru Speaks, a community conversation series is one of Meta-Culture’s community-focused initiatives, and had for its eighth theme: “Competing Cultures: Morals, Malls and Marriages”. The stated goal of the programme was to engage the people of Bengaluru in constructive conversation about critical issues so as to strengthen relationships across the city and create a more secure, cohesive and viable community. The event was organised to facilitate dialogue ‘in times of a rapid change, socially and culturally,’ said Gayatri of Meta-Culture, as she introduced the theme and event. “What do you think of when you hear 'Competing Cultures – Morals, Malls, and Marriages? '” was the question the group of 50-plus assembled Bengalureans were asked. The event was open for all and people from various backgrounds were present: IT professionals, college students, activists and writers. As Bengaluru spoke, Gautam Sonti, a local filmmaker, filmed the event for a documentary about change in Bangalore. An initial large-group discussion was launched with a Meta-Culture facilitator asking the participants questions such as: “Why issues of cultural change are important to talk about” and “How have recent events [like the attacks in Mangalore, the controversy around Valentine’s Day] impacted you personally?” The responses of the participants included comments on ‘the ongoing westernisation’ and ‘confusion about culture’ and seeing the Mangalore attacks as ‘attacks against women’ and ‘moral policing’. The necessity of a dialogue was established through this initial response-round. The facilitators then asked the participants to seek out 4-5 people who they did not know, to make smaller discussion groups and were given a set of ground rules (to speak from personal experience, listen and reflect). One Meta-Culture facilitator was assigned to each group and the participants were challenged to explore their opinions, feelings and even their biases with regard to three different topics: marriage and dating, shopping malls, and pub culture. These discussions threw up diverse opinions that participants in the group engaged with and responded to variously, with agreement, awe, tolerance and occasionally even a sense of shock! The smaller-group discussions were then directed to a large-group discussion where Beth Fascitelli, a facilitator at Meta-Culture, asked the participants to make a list of the good things about Indian culture that they would seek to protect at all costs. The list contained a rich variety of responses: rangoli, grandmothers’ pickles, festivals, family, unconditional hospitality and saris. Then Beth threw the group an unexpected googly. She said, “If tomorrow you woke up and there was a coup d’état in India, and suddenly I’m the new ruler of the country… and I decide I hate Indian festivals, and so I make a new law banning Indian festivals.” She slashed away at other items of the list that, under her hypothetical rule, she would ban from Indian life and then asked the participants: “What would you do if any of this was taken away?” This evoked strong responses ranging from ‘revolt’ and ‘subversion’ to ‘brutal attack’. Beth ended by asking, “Could people who disagree with you have feelings as well?” A few of the participants said yes, thus making space for, what was the set goal – a dialogue. So participants who until then were "condemning the attacks" had themselves responded with an "I will attack you". It was quite clear that even those who came across as considerate and reasonable in responding to one party had been blind to the other one, and had failed to see what was necessary for a dialogue. The attempt at empathizing (by raising a question about feelings) may not exactly have been the intellectual key that some participants said they had come looking for, but Meta-Culture’s attempt was a brave one. However, some of the questions I could not help asking myself were: Was it really true that as Beth said, ‘Dialogue is new in India?' Could modern-western frameworks already have set the terms for a dialogue? And could attempting dialogue without engaging the themes fully be productive at all? I wish the final discussion of the event had been allotted more time so that Beth’s googly sunk in more fully! The next Bengaluru Speaks is on Saturday, 4th April, 4:30 PM at Ashirvad Community Centre, St. Mark’s Road. Theme for the next Bengaluru Speaks is: "The Urban Woman: inspiration, challenge, threat?" Bengaluru Speaks, I thought represented a much-needed space, wherein the monotonous bashing of any one group or the professing of a pre-decided political position was neither the aim nor the result. A free and formal stint on a thematic of community-interest that ushered in the beginnings of a dialogue was what the evening saw. If you did not stay till the end of the event, you are very likely to have missed the point! A still from the movie 'Gulabi Talkies'. The movie was seen as a response to contemporary society in a discussion that followed the film's screening. Art, Resources, Training Trust (ART) on 12th July, 2009 screened Girish Kasarvalli’s Gulabi Talkies at the Badami House located near NR Circle. Renowned scholars from the field of Film- Studies and Literature took part in the discussion that followed the screening. This was ART’s second event. Although Sunday morning 10 AM did not see many Bengalureans at the screening, the regulars did not miss it: film-makers, artists and students. The event brought together scholars belonging to different institutions as well as Kasaravalli. Mamata Sagara, Kannada poet and faculty at Central University, Hyderabad, began the discussion by suggesting that Kasarvalli was a film-maker who responds to contemporary society and that we should understand Gulabi Talkies as his latest response. She said that the film cannot be considered singly, independent of Kasarvalli’s other films. N Manu Chakravarthy, Professor at NMKRV College for Women, scholar, author and editor of several books, said that he saw a marked movement from Haseena (another film by Kasarvalli) to Gulabi Talkies. He said that while Haseena represented a time when crises in identity could be resolved organically from within a minority community’s resources such as texts and practices, Gulabi Talkies represented a time when such a resolution had become impossible. Tejaswini Niranjana, founder scholar of Centre for the Study of Culture and Society (CSCS), author and importantly translator and editor of the book, Gulabi Talkies, a collection of Vaidehi’s stories translated into English, was also a discussant. She said that the film was very different from Vaidehi’s story and demanded independent consideration. She also noted that the film captured the less investigated after-life of cinema within television. In the discussion that followed, some opined that the film threw around categories such as globalization and communalism too easily, while others insisted that they would value the film for its humour and the human spirit it represented. Kasaravalli responded to questions and talked about the research that had gone into the film, from the Kargil war of 1999 to the rise of communal hatred along the fishing shores of Karnataka. The reinterpretation of Gulabi, a prostitute in Vaidehi’s story to the cinema-crazy Muslim midwife Gulnabi in Gulabi Talkies was discussed, bringing to the fore the interlinkings between the politics practiced and artistic choices made in the film. ART intends to organize more such events every month. Hopefully Bengalureans will get a good share of scholarly discussions through them! ART also has a growing library of over 2500 books, 100 journals, CDs, DVDs and an image archive. Its library can be used for a charge of Rs. 25 per day for students and Rs. 50 for scholars and professionals. For more information visit ART’s website or email and look out for the intimation of their next event on Citizen Matters’ event listings. Sushumna Kannan is a scholar at the Centre for the Study of Culture and Society (CSCS), Bangalore.